Visual function of lens accommodation was measured while subjects used stereoscopic vision in a head mounted display (HMD). Eyesight with stereoscopic Landolt ring images displayed on HMD was also studied. In addition, the recognized size of virtual stereoscopic images was estimated using the HMD. 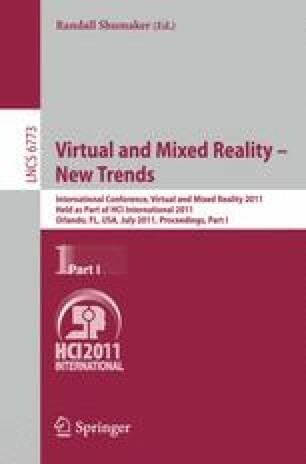 Accommodation to virtual objects was seen when subjects viewed stereoscopic images of 3D computer graphics, but not when the images were displayed without appropriate binocular parallax. This suggests that stereoscopic moving images on HMD induced the visual accommodation. Accommodation should be adjusted to the position of virtual stereoscopic images induced by parallax. The difference in the distances of the focused display and stereoscopic image may cause visual load. However, an experiment showed that Landolt rings of almost the same size were distinguished regardless of virtual distance of 3D images if the parallax was not larger than the fusional upper limit. However, congruent figures that were simply shifted to cause parallax were seen to be larger as the distance to the virtual image became longer. The results of this study suggest that stereoscopic moving images on HMD induced the visual accommodation by expansion and contraction of the ciliary muscle, which was synchronized with convergence. Appropriate parallax of stereoscopic vision should not reduce the visibility of stereoscopic virtual objects. The recognized size of the stereoscopic images was influenced by the distance of the virtual image from display.